These clients sought a change of pace and longed for a small, yet well-appointed condo that reminded them of their East Coast upbringing. 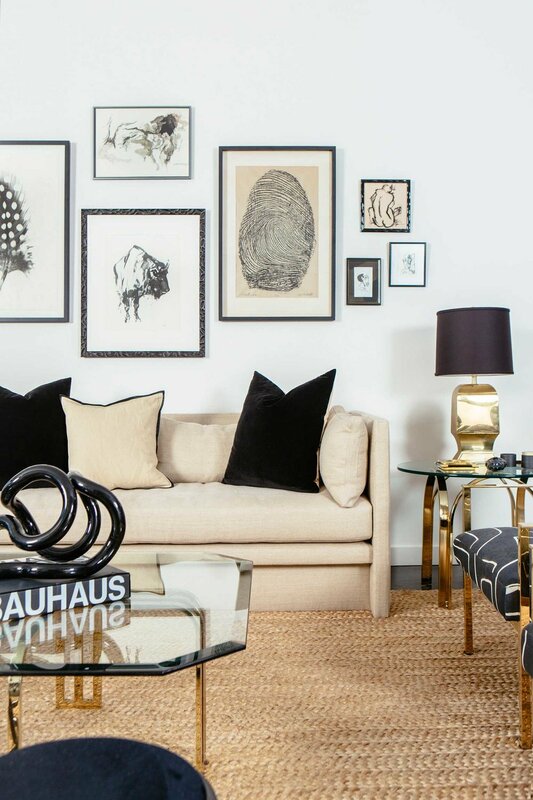 We immediately envisioned an NYC inspired home that was both sophisticated and family friendly. The dark paneled library with lacquered ceiling and 70’s vintage lucite chandelier set the tone for a moody atmosphere. The cleverly designed paneled doors open to unveil the powder room and lacquered office. The living area features vintage brass furnishings and comfortable seating. Wicker accents such as the oversized wicker light fixtures in the kitchen and hooded wicker chair add texture and drama to the home. The palette continues into the master bedroom with brass accents, soothing tones and oversized floral patterned wall covering.